Thomas Bjorn keeps his promise to have Europe's Ryder Cup-winning score tattooed on his backside! 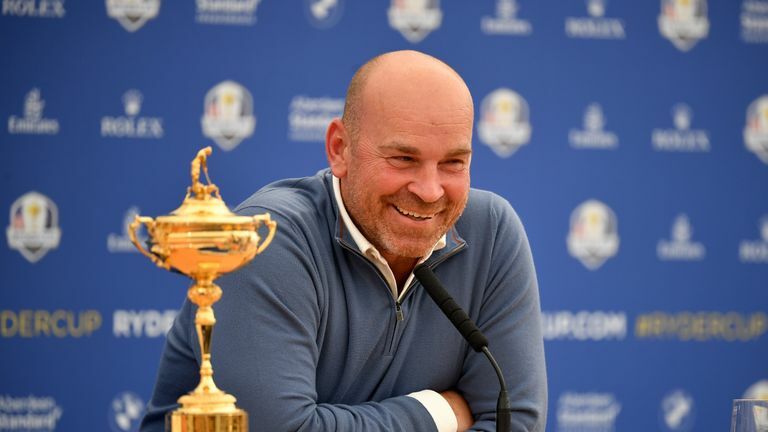 Thomas Bjorn has kept his promise to have Europe's Ryder Cup-winning score tattooed on his backside. Europe's captain said he would have the tattoo if his team beat the USA this summer, and just days before Christmas, Bjorn made good on his pledge. Europe were firm underdogs going into September's event at Le Golf National near Paris, prompting Bjorn to promise the tattoo should his team pull off a surprise victory. After Europe reclaimed the trophy, the 47-year-old described the pledge as the "worst decision he made all week" and said the artwork would not be visible to the general public. "Let me put it this way, it's going to go on a part that only Grace (Bjorn's partner) will see," he said. "I might have to send the players a picture." Hit play on the video at the top of the page to watch Thomas Bjorn's visit to a tattoo parlour to get inked up.